JET-HOT Sterling extends header life dramatically, often by 20 times or more in street applications up to 1,300 degrees. JET-HOT Sterling cuts heat in engine bays, saving you money on plugs, wires, fan motors, water pumps and other heat-sensitive parts. JET-HOT Sterling reduces header-surface temperatures by over 50%. JET-HOT Sterling boosts power by 3% or more on muscle engines. JET-HOT Sterling shines with the best, yet offers high-temp tech. JET-HOT Sterling will not rust, pit, corrode or discolor from heat. The test results shown are based on the performance of JET-HOT® Sterling T .
JET-HOT® Sterling creates a thermal barrier. Because of its low emissivity and insulating effect, JET-HOT® Sterling creates a thermal barrier to protect headers - inside and out - while reducing heat transfer into the engine compartment. But the good news goes beyond protecting headers from thermal fatigue. Plugs, wires, fan motors, water pumps and other heat-sensitive parts get a break, too, in a cooler environment. Plus, power normally increases and safety for racers improves with lower temperatures. The graph shown above, developed independently by a major US automobile manufacturer shows just how effectively JET-HOT® Sterling T beats heat. The company's engineering team was astounded by temperature reductions exceeding 300 0 F when JET-HOT® Sterling was applied to standard exhaust components. CarCraft also took a cool breath, after measuring temperature reductions of over 60% on header surfaces following the application of JET-HOT . Horsepower gains depend on many variables, including engine size, type and setup; cooling system performance; ambient temperatures; and other factors. 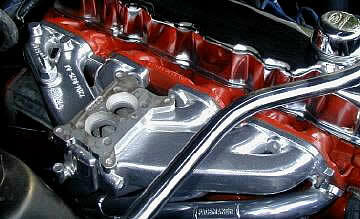 Nevertheless, JET-HOT Sterling will normally boost power when applied to headers for two reasons. First, the coating promotes denser, more potent fuel/air charges by insulating the engine bay from exhaust heat. At the same time, it accelerates the pulsed-vacuum effect on tuned headers, resulting in more effective scavenging of cylinders. The increased velocity of exhaust gases produced by higher exit inertia not only clears each cylinder more quickly; it also draws in the next fuel/air charge more efficiently. JET-HOT® Sterling provides lasting beauty. Its appearance shares the brilliance of chrome and the subtly of nickel. Other metallic-ceramic coatings look dull in comparison. The RMS numbers (a measure of smoothness) shown above, demonstrate how far JET-HOT has jumped ahead of other coatings. With the addition of silver powder to our exclusive formula, we have 3 beautified " our coatings by a factor of six on the RMS scale while improving performance. The chart above provides a comparison between JET-HOT and alternative methods for retarding rust. Quoting Carcraft Magazine (August 2002): " Anyone who still runs painted headers is a flake! " The chart shows why. At the same time, some producers of 3 high-tech " coatings actually promote 1,000 hour survival in this salt-spray test as a benefit. In startling contrast, JET-HOT Sterling T withstands the same salt attack for over 5,000 hours. The testers called it quits before Sterling caved in. JET-HOT increases the endurance limit (fatigue strength) of most alloys subjected to stress loads, such as vibration produced by an engine, after exposure to high temperatures. In addition, JET-HOT does not contribute to hydrogen embrittlement, a condition associated with chrome and other coatings in which microscopic cracking can lead to premature and sudden part failure. The comparison to the left represents the average performance of 403 stainless steel, uncoated and coated with JET-HOT , after 10-million stress cycles. The results demonstrate how effectively JET-HOT protects substrates from thermal fatigue. During tuning of certain engines, lean or rich fuel/air mixtures can cause hot spots around 1300F degrees. If you are not careful, you will damage the coating and possibly the engine. The coating will definitely turn dull and possibly flake off if these temperatures are reached or exceeded. During this period, Jet-Hot recommends using a large floor fan to cool the entire engine and headers. If available, use an old exhaust manifold for initial start up and timing. Ignition timing is critical to exhaust temperatures which are not reflected by the water temperature gauge. It is not unusual to see 190F degrees on the water temp gauge even though the exhaust temperatures are exceeding 1300F degrees. Failure to take these precautions could result in permanent damage to the coating. Many vehicles, especially street rods and race cars, have restricted air flow around the engine. To minimize the problem, install the largest possible radiator and cooling fans. This should not only protect your headers to the fullest, but it will also assist in preventing engine overheat. Most stains on Jet-Hot Sterling can be removed with very hot water or a non-abrasive aluminum polish (e.g., Wenol, Wax Shop, Mothers, Never Dull). Wash your headers once a year with soap and hot water and polish them occasionally. Jet-Hot Black, Blue, Gray or 2000 should never be rubbed or polished. If storing your car for the winter season, wash and dry your car, then park the car over a large plastic tarp. This will help protect your car against moisture seeping up through the concrete floor or ground which may cause surface rust and pitting. Jet-hot backs its coatings with a limited life-time guarantee against rust through on new components when all exposed surfaces of the part have been coated with Jet-hot. If the metal beneath the coating rust through, they will repair and re-coat the part at no charge. If you are dissatisfied with your Jet-Hot coating within three years from the original date of purchase, they will re-coat the part at no charge, one time, with the same coating originally specified. Shipping cost for repair and/or re-coating are the responsibility of the customer. Failure to read and follow the instructions for "Care During Installation" may void this warranty. Classic Inlines is proud to be a distributor of JET-HOT Sterling ceramic coatings, and will assist our customers in getting their parts coated. Simply prepare your parts prior to shipping them to Classic Inlines, and we'll take care of the rest. All parts must be completely disassembled prior to shipping. Jet Hot will media blast all parts to remove the old paint, rust, or grease, but if you are seeking a smooth finish, it is best achieved if all prep work is done before shipping. This includes filling cracks, making repairs, and sanding to desired finish. Chrome parts may be coated, but there is an additional charge for removing the chrome prior to being coated. For prices, see JET-HOT under our product listings.